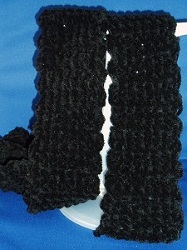 The black scarf is made with Lion Chenille Thick & Quick. I originally bought it for a specific pattern. 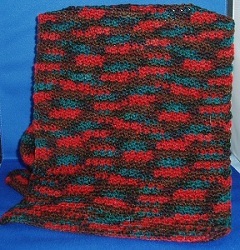 After several agonizing attempts, I realized that all I would ever be able to do with it was single crochet. So I made a scarf. In my initial infatuation with homespun, I bought several colors. 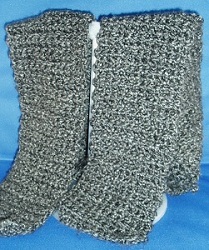 It proved to be rather difficult for me to work with, hence, the gray and orangish scarves. 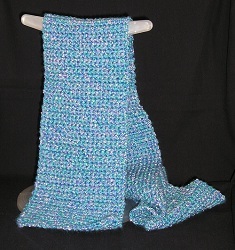 Even with just single crochet, the lovely soft texture and interesting coloring makes a nice scarf. and color variation of the yarn. 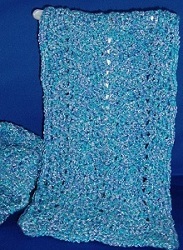 from the August 2009 issue of Crochet World. 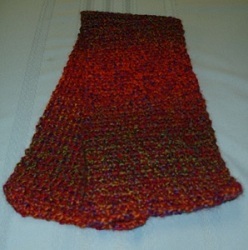 This is just a wide scarf done in single crochet. just using single and double crochet . I used another yarn I bought just because I liked it. It is an off-white/cream with flecks of brown. 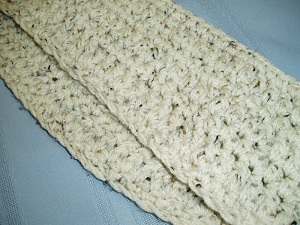 I made this with a boucle type yarn. It has a nice shimmery thread in it.